What if a single warrior could have the knowledge of thousands? In the late 1990s, Nate Allen and Tony Burgess (both US Army Captains) sat on their back porches in Hawaii and swapped stories about their experiences as company commanders and pondered the question above. They had a vision about connecting all company commanders in this form of conversation. They were joined by a few others who shared this vision and in 2000 www.CompanyCommand.com was launched. Five years later, they were two of the authors of the book Company Command: Unleashing the Power of the Army Profession. If you are interested in Communities of Practice this is an important book to read. CompanyCommand was the forerunner. There are now over 50 similar forums, 2,900 new members per month and 75,000 unique visitors per month. There are a bunch more facts here. 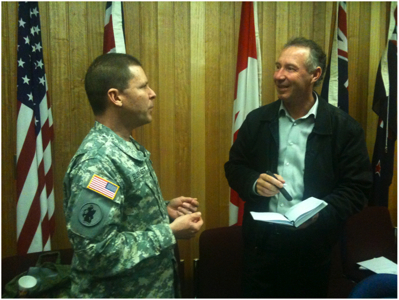 Two weeks ago I gave an after dinner speech to the Australian Army Knowledge Management conference. Just before the speech I was introduced to the guy that has responsibility for running the Battle Command Knowledge System, which hosts CompanyCommand along with fifty other forums, Colonel Charles (Chuck) Burnett. I was a bit taken aback as I had a copy of CompanyCommand in my hand and was intending to use it as an example during the talk. I was fortunate to spend some time talking with Colonel Burnett the next morning and he was very generous with his time. I was particularly interested to hear that one of his greatest challenges is continually justifying the value of the forums like CompanyCommand to his chain of command. Not that having to justify the value of a community of practice is a new thing; its just that having to justify the value of one of the most visible CoP success stories in the world seemed remarkable. To tackle this, he conducted a survey last year to collect examples of how the communities of practice were making a difference. There were 2500 responses; problems overcome, mistakes avoided, money saved … lives saved. The collected stories are now a key part of communicating the value of the CoPs (we have previously blogged about this technique here and here). It became clear to me…that CompanyCommand.com was not about the website. Rather it was about a community of professionals sharing and learning in a fast-paced dynamic operational context; the technology simply enabled the process. In fact, the more I thought about and observed the…forum, the more I realised that the core technology of the forum was the people and the conversations, not the computer. Mark, great posting. The link to BCKS did not appear in the “here”.